Some estimate California to being the number one tourism destination in the country and records show that over 250 million tourists visit California each year.San Diego hosted at least 35 million visitors last year on its own. Count me in as one of the 35 million as we set out to do a true staycation and visit one of the nicest resorts in San Diego. We didn’t have to travel far as it was only about 35 miles from home.This was to be a relaxing vacation, one where we had nowhere in particular to go and nothing special to do.The idea was to just enjoy the resort, relax by the pool, fish, eat, sleep in, and maybe drink a little. 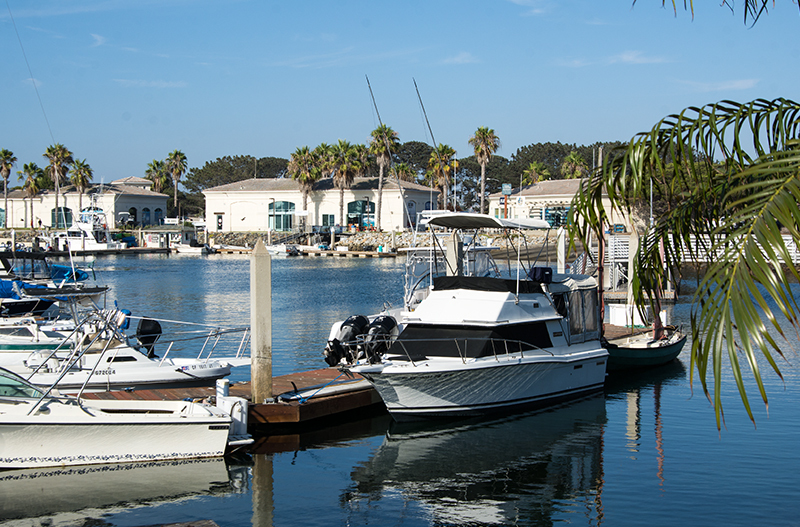 The Dana Hotel in Mission Bay is situated around a small marina that offers its guests rentals of every type of water craft. Also, you can set up your fishing pole anywhere along the marina or the larger part of the bay just beyond the resort. 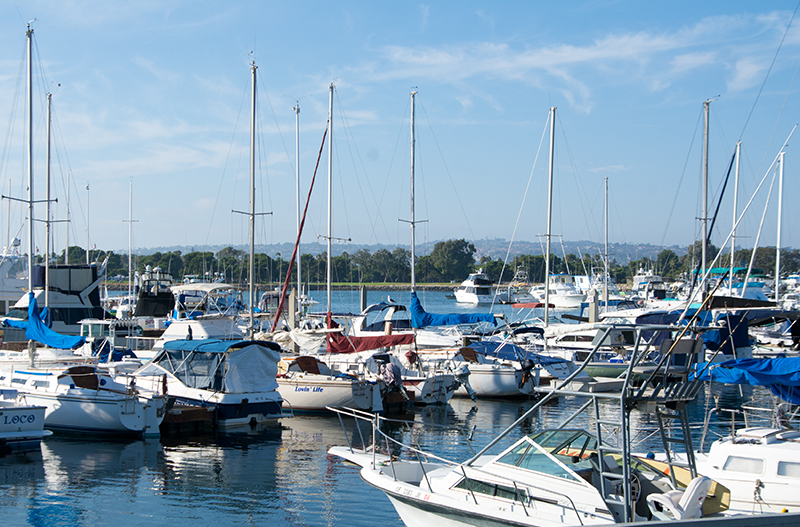 On the Mission Bay side of the hotel there is a walkway that takes you along the water’s edge with sweeping views of the bridges, boats, inlets, and Fiesta Island. You can sit there for hours watching the boats go by. It is pure relaxation. 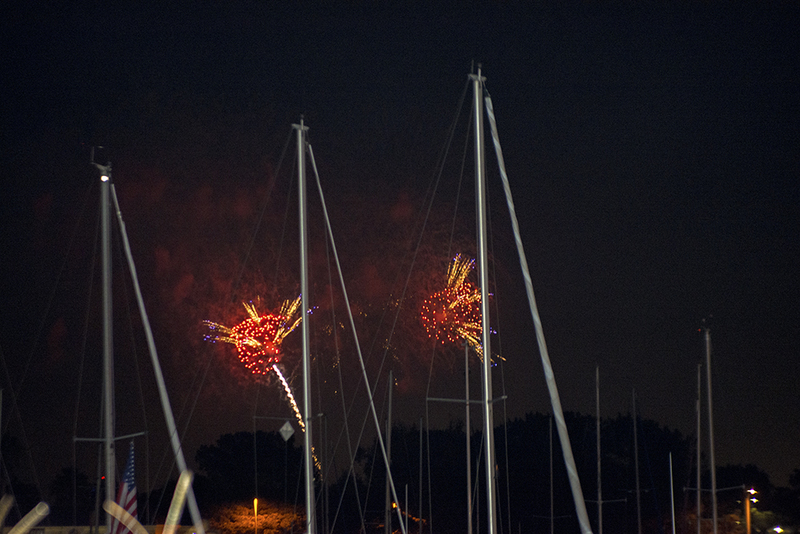 I loved watching the sailboats as they made their way up wind and marveled on how this was actually accomplished. At sunset, we threw out our line a few times and actually did catch some fish. It was the quaint marina that was the star though, especially when the sun was setting and the now calm water lit up in a glowing orange tint. At night it was peaceful, you could hardly hear a peep from anyone except around the two pools where music blazed from either piped in music or a live duet playing near the Firefly Restaurant and Bar. 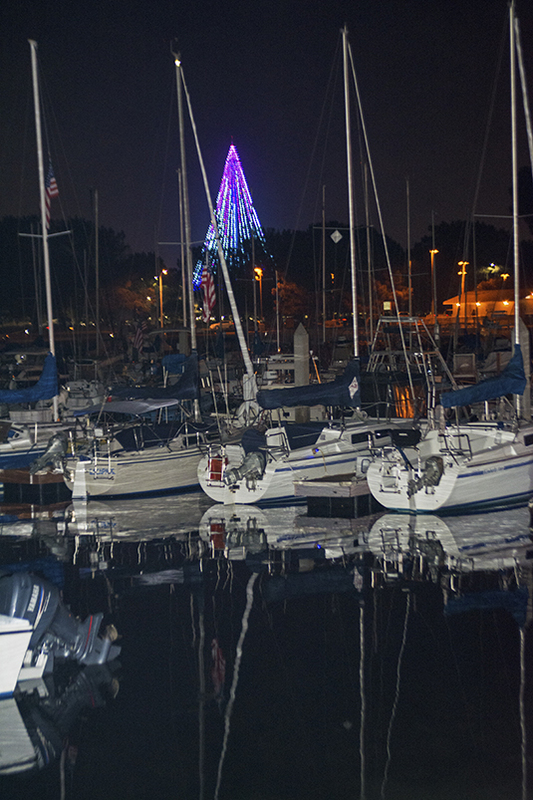 The marina is still and calm at night while the tower at Sea World shines bright. 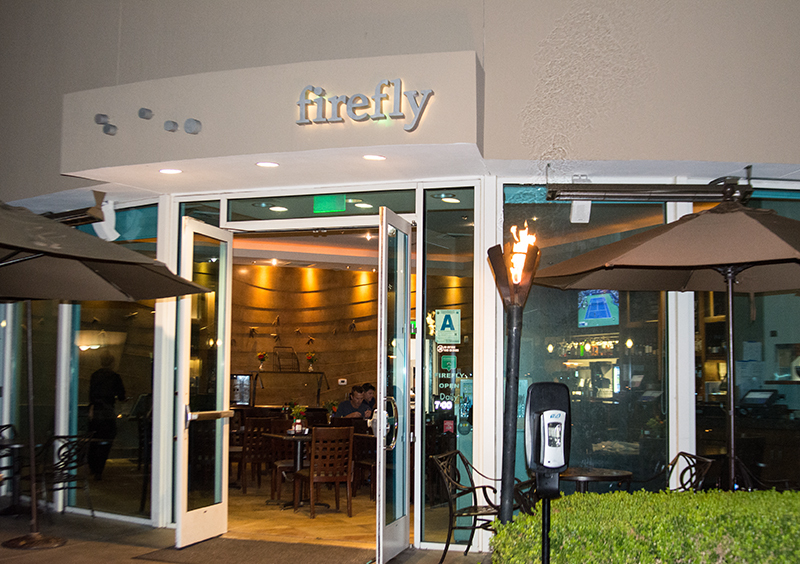 The Firefy Restaurant is situated near the pool closest to the lobby and had outdoor seating which was nice. Nearby we sat by the fire pits while listening to the mellow sounds coming from a female singer and a guitar player. A live cooking demonstration was put on earlier and although I don’t like sea food, a few of our crew devoured the sample plate as if it was their last meal. They all reported after, that the raw tuna dish tasted awesome. 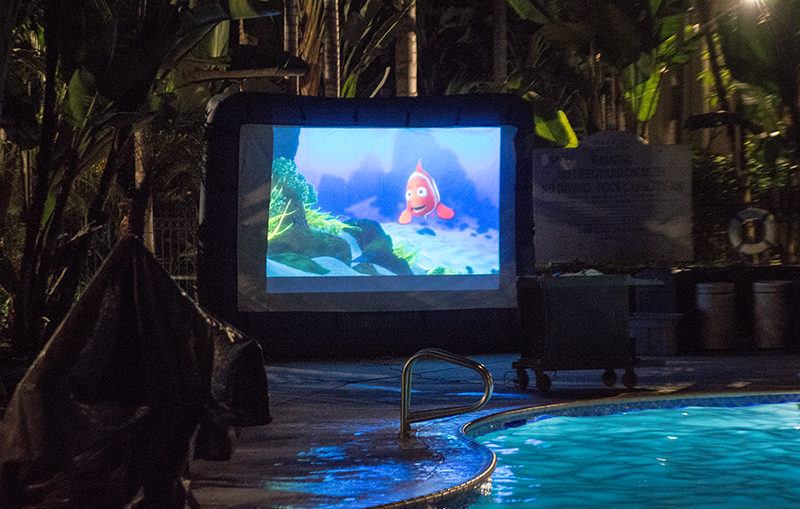 That night they had a movie playing by the pool and you could either view it in the comfort of your chair or hang out in the water. It was a warm night and a perfect setting for kicking back while watching a movie. The Tropical Bar was open for drinks and a sizable Jacuzzi was nearby. 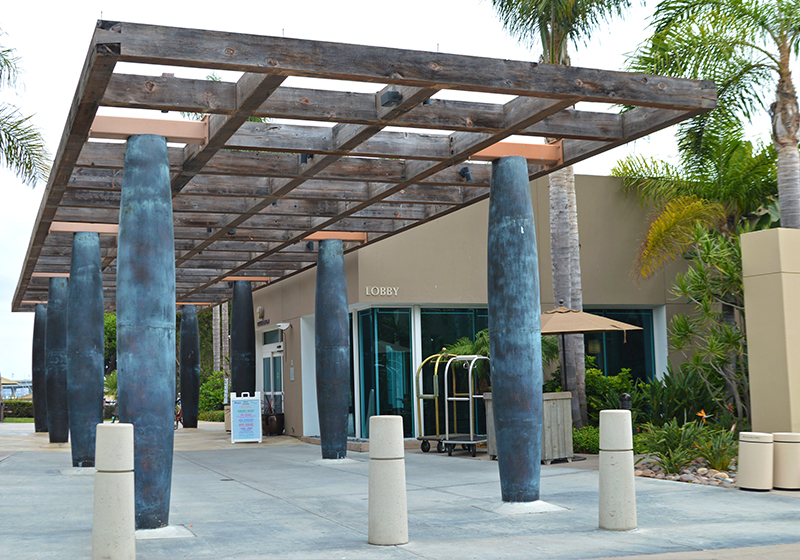 The property at the Dana is filled with palm trees and various other tropical plants. It looks like something out of Hawaii. The rooms are nicely decorated and even the cheapest is roomy enough. There are obviously the more expensive rooms that look directly over Mission Bay and some have sizable balconies. This was a last minute reservation so I got what I got. Even at that, it was near everything and had a slight view of the pool and the tropical plants. Just a few steps and we were right at the marina. We saw at least four weddings taking place that weekend as the hotel provides a great venue. 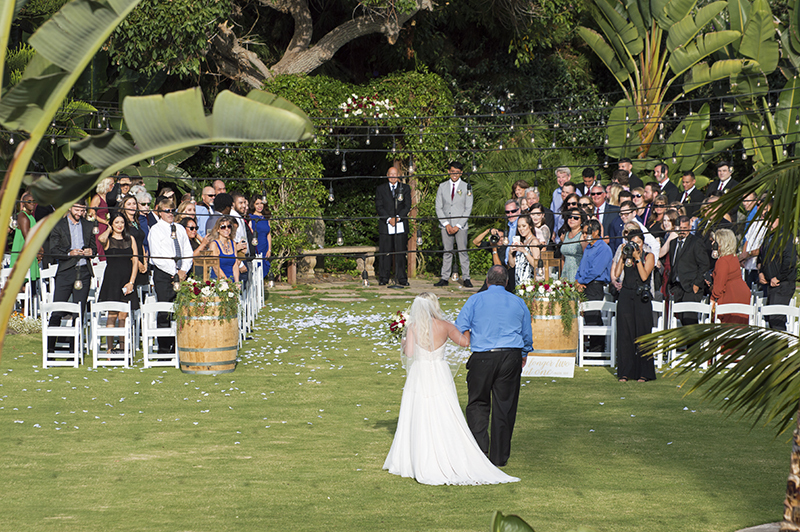 Set only feet from the marina, a grassy area provides a perfect place for nuptials. There are decorated arches, beautiful plants, and white lights for the evening. Just a short walk away, the hotel also offers meeting rooms that can be set up for any size reception. 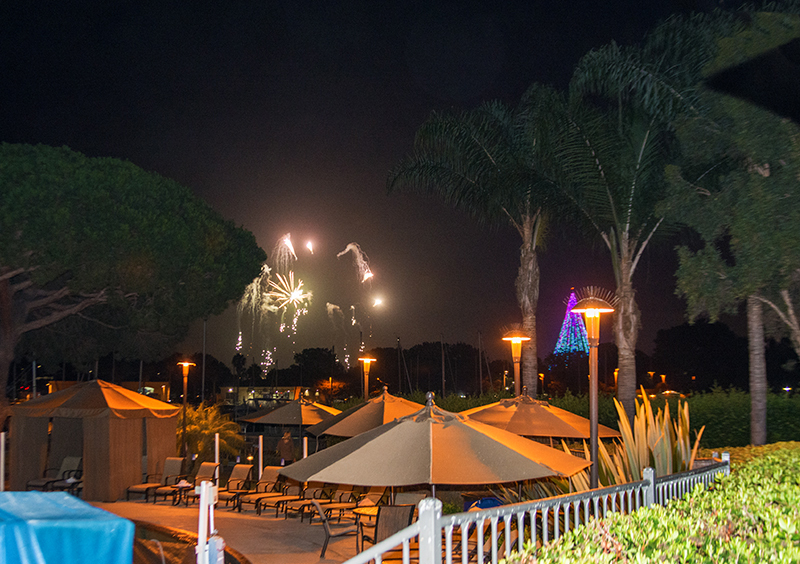 On Saturday and Sunday night, Sea World provided a six minute fire work show that could be seen from various spots around the hotel. Speaking of, we were very close to Sea World so if that is some place you would like to go, the Dana would be a perfect nearby hotel to stay. However, it isn’t cheap and you have to consider resort fees and parking charges. For what it is, I was impressed and it is worth every dime. They do give you about $30 of food credits of which we utilized and half-off of their buffet which we also used. If they were charging resort fees, we were going to use every penny of the free stuff! They also gave you a voucher to use a bicycle for four hours and we utilized those too! We went from one end of the long sidewalk/walkway to the other and enjoyed every minute. On the other side of the marina there was a kayak shop that was giving away free hot dogs, drinks, and corn-on-the-cob, so again with the price of the hotel, we were going in for free grub! The weather was beautiful and biking along Mission Bay was perfect and made us realize that even though we are close to home, we are still very far away. 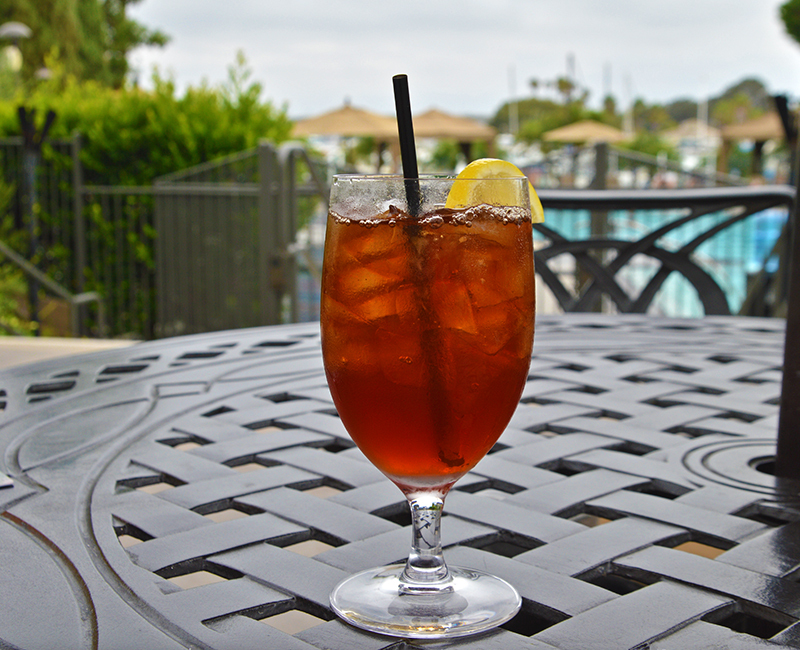 The Dana Hotel is a great resort and worth the money you spend. All is very relaxing there except for one thing as I will go into next. 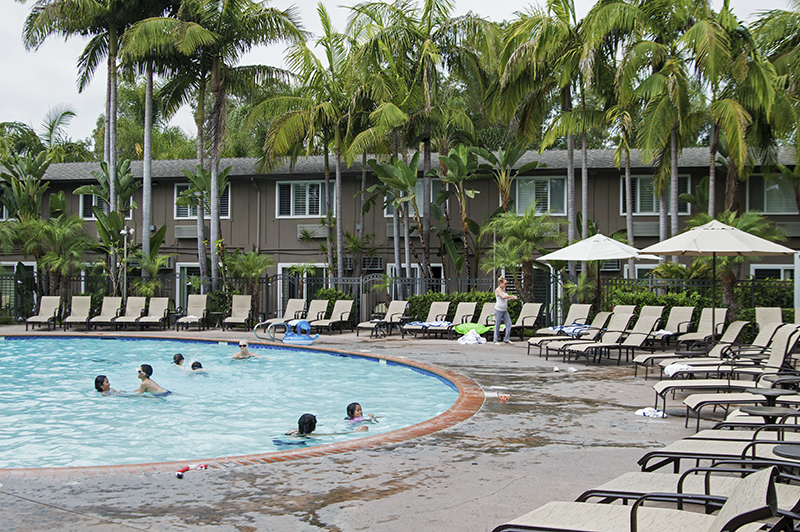 The Two pools at the Dana are beautiful, large, and look super clean. 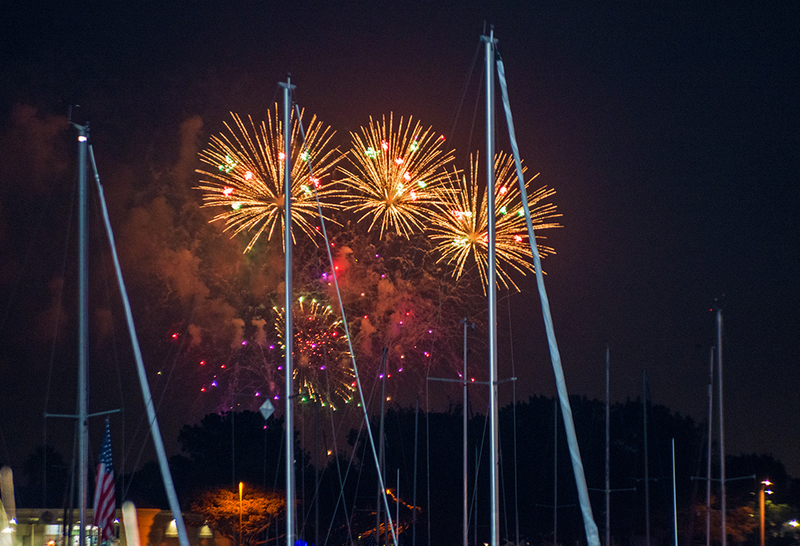 The one nearest the Firefly has an infinity edge that looks out over the marina. Tiki lamps are scattered about giving more of that Hawaiian feel, plus by both pools there is a ping pong table and bean bag toss games. The only negative I would say about the hotel is more of a personal one. 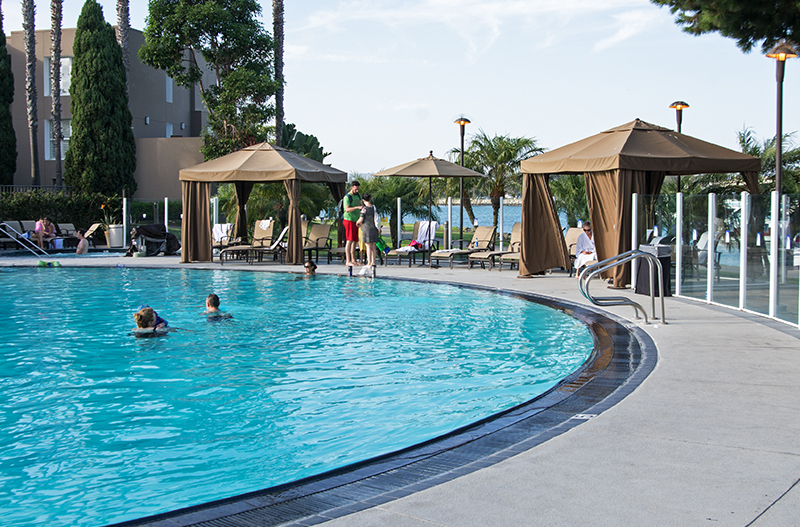 Now I know as a family resort that there will always be tots in the pool, I mean why not, kids love pools! So why did I even think that I could have a peaceful little nap by the pool is beyond me. First let me say that I love kids and they don’t bother me when they are noisy. I love the innocence of the way they play and laugh. However there was always one kid whose voice was louder than a freight train horn and he always managed to yell right when he was next to where my lounge chair was situated. Surprisingly, I did manage to get in a few winks when ‘freight train’ was on the other side of the pool. I swam to the other side of the pool. The next day I did manage to get a good half an hour nap and woke up just after there was a big commotion. Seems that there was a poo extraction in the pool, yes you read right, a poo extraction. One of the little tykes left a big brown surprise for all of the swimmers. Just moments before I woke up, there were people exiting the pool as if ‘Jaws’ himself was on the loose. Harsh chemicals were administered and the pool was closed for two hours. Note to self… next time find a hotel that has an adult only pool. Other than that, we enjoyed our stay and it was all we had hoped while achieving our goal for a relaxing weekend with nothing planned!! Yet, we did do something…we fished, we ate great food, we biked around the bay, we watched movies by the pool, listened to live music around a fire pit, enjoyed the views, biked, sat in Jacuzzis, saw fireworks, swam, slept in, and napped. 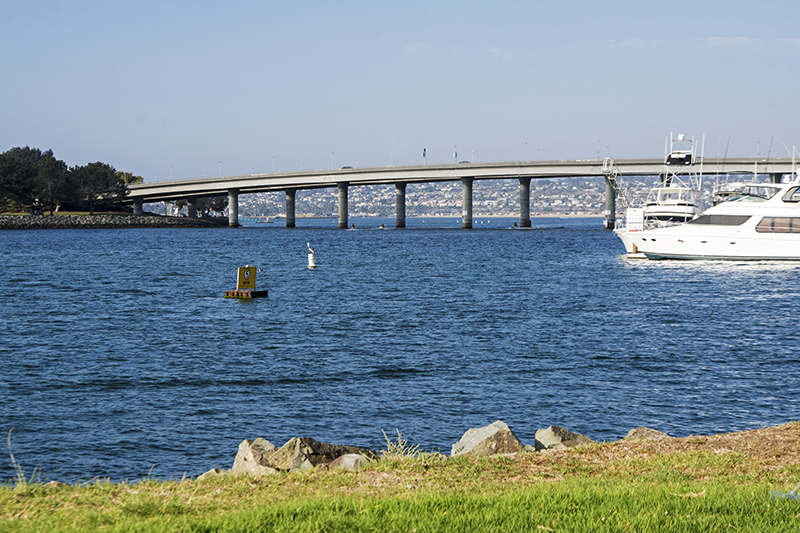 There is so much more you can do in the area as far as San Diego attractions and even around the hotel there is a lot to do. However, being mellow is what we wanted and other than the mishap at the pool, tranquility is what we achieved. I recommend the Dana regardless of what type of mood you are in and bring the pups because it is also dog friendly!